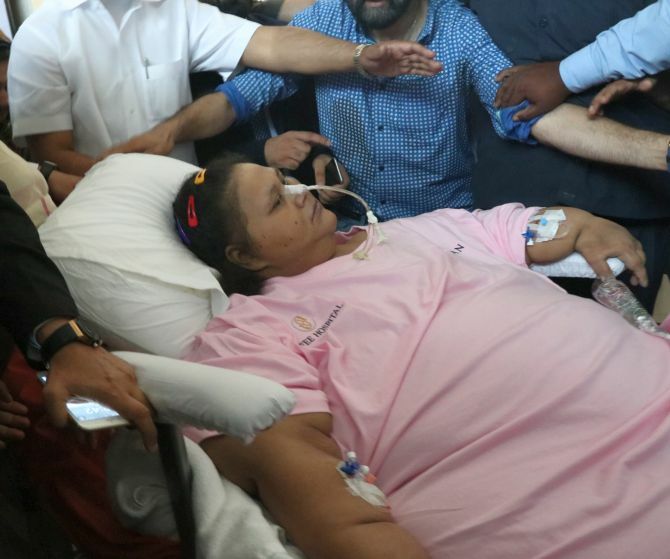 Egyptian national Eman Ahmed, who was until recently believed to be the world's heaviest woman, on Thursday got discharged from Mumbai's Saifee hospital where she underwent treatment for severe obesity. The 37-year-old was discharged from the hospital around 12.40 pm for further treatment in the UAE, bariatric surgeon Muffazal Lakdawala said. A green corridor has been created for transporting Eman from Saifee Hospital to Gate No. 5 of Terminal 2 at the Chhatrapati Shivaji Maharaj International airport. Her flight to UAE will take off around 6 pm on Thursday, he said. According to Lakdawala, Eman's weight has now come down to 170 kgs (as on Wednesday evening). She weighed a whopping 498 kgs on her arrival in India in February this year. On Wednesday, Lakdawala had said that Huzefa Shehabi, COO Saifee Hospital, had received an e-mail communication from VPS Burjeel Hospital (in Abu Dhabi, UAE) saying that Eman is "stable, in good health and fit to fly" paving way for her discharge this afternoon. Eman's sister Shaimaa in an online video last month had alleged that she was not receiving proper treatment at the privately-owned hospital in South Mumbai. She had alleged that the doctors at Saifee, made "false claims" about Eman's complete recovery and weight loss of 262 kg. Refuting the allegations, Aparna Bhaskar, section chief of bariatric surgery at Saifee Hospital, had said that Shaimaa may be criticising the doctors to extend her sister's stay at the hospital. Lakdawala too had denied the charge. Eman, a resident of Alexandria in Egypt, had not stepped out of her house for more than two decades due to her obese condition followed by a stroke that left her paralysed on one side a year ago. It was Shaimaa, who learnt about Lakdawala and his expertise in bariatric surgeries and approached him for help early this year. "It took almost a month for me to form a team of doctors, chalk out a detailed plan for her treatment and then we decided to get her here. Every treatment plan, method was debated with great detail. Hence, we could reduce her weight from 498 kgs to 170 kgs," Dr Lakdawala said. In a blog, Lakdawala said that Eman's sister has been promised by Burjeel Hospital officials that "Eman will be able to stand and walk". The doctor said that Shaimaa insisted she had wanted the hospital (Saifee) to keep Eman till she could walk and the management said that was not possible because of the advice we have received from one the foremost orthopaedic surgeons in the country. "Shaimaa then said she has been promised by Burjeel Hospital officials that Eman will be able to stand and walk soon. We told her we would not over-promise and we would not put the patient at risk. This is the crux of her issue with the Indian doctors and hospital," he said in the blog. Eman underwent bariatric surgery in March in which doctors reduced the size of her stomach by two-thirds, so as to reduce her food intake. Her genetic tests had showed that she has a rare gene mutation that cannot be cured through surgery. She was treated by Lakdawala and a team of around 15 doctors from various disciplines since she was brought here from Alexandria on February 11 this year.